Figure 1: The assembly of ASNT with enumeration of 8 measuring channels (scintillators) and chart indicating orientation of detector axes relative to direction to the North Pole. Aragats Solar Neutron Telescope (ASNT) located on the slope of the mountain Aragats (Armenia), 3250m above sea level. Geographical coordinates is 40o28'N, 44o10'E. ASNT is formed from 4 separate identical modules, as shown in Figure 1. Each module consists of standard slabs of 50x50x5cm3 plastic scintillators stacked vertically on a 100x100x10cm3 horizontal plastic scintillator slab. Scintillator slabs are fine polished to provide good optical contact of the assembly. The slab assembly (scintillator housing) is covered by white paper from the sides and bottom and firmly kept together with special belts. Total thickness of the assembly is 60cm. 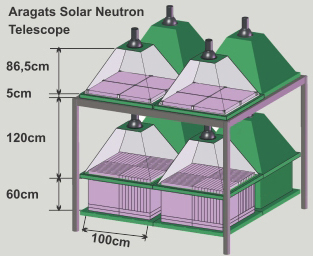 Four detectors of 100x100x5cm3 size each located above the thick scintillator assembly as is seen in Figure 1, are used to indicate if charged particle traverse near vertically. This information is used for selecting neutral particles and “vetoing” charged particles. A scintillator light capture cones and Photo Multiplier Tubes (large cathode, FEU 49 type) are located on the top of scintillator housing in special iron shielding, where as well the Amplitude-Digital-Converters (ADC) and other electronics is located. Initial goal of the ASNT was to be a part of the worldwide network aimed to detect neutrons born in photosphere and reach Earth bringing direct information from its origin. The network is coordinated by the Solar-Terrestrial laboratory of the Nagoya University (Tsuchiya et al., 2001) and consists of seven same type detectors distributed at different longitudes to observe the sun 24 hours daily. In addition to the primary goal of detecting the direct neutron flux from the Sun, the SNT also has the possibility to detect charged fluxes (mostly muons and electrons) and roughly measure the direction of the incident muons. Also ASNT constitutes a central part of the new surface array to be in operation at Aragats in 2009 (see MAKET section). The main ASNT trigger reads and stores the analog signals (PMT outputs) from all 8 channels if at least one channel reports signal. The frequency of triggers is ~4 KHz due to hit of charged and neutral particles. Big advantage of ASNT is additional, so called, software triggers, exploiting the information from ADC on energy releases in scintillators. Energy releases in upper or bottom scintillators conditioned on absence of signal in correspondingly down and upper layers and on minimal energy release, i.e. horizontal muon trigger. We use XML format of data, allowing metafiles with detailed information about detector location, and operation conditions. After transfer by wireless connections to CRD headquarters in Yerevan the data are archived and stored in MySQL data base. The main data analysis platform, Advanced Data Extraction Infrastructure (http://adei.info/) now is operated with data base and allow us download data in ASCII, CSV, ROOT formats (http://adei.crd.yerphi.am). All raw data in the XML and csv formats is available from HTTP server at CRD headquarters in Yerevan from the link http://192.168.24.118/index.php?page=data.php . columns 9-24 – the count rates corresponding to the 16 coincidences in upper and bottom ASNT layers, i.e. – corresponding to the traversal of the single charged particle (the probability that neutron will generate energy release in 5 cm scintillator is rather small). The order of the different directions in the file is following: [1-5] [1-6] [1-7] [1-8] [2-5] [2-6] [2-7] [2-8] [3-5] [3-6] [3-7] [3-8] [4-5] [4-6] [4-7] [4-8], where the first number corresponds to the lower layer and the second – to the upper (see Figure 1) Also on the same Figure you can see the orientation of ASNT axes according to direction to the North Pole, thus we can calculate the interval of the horizontal angles of incidence related to each coincidence. columns 25-31 – the count rates of the “special” coincidences different from listed above and forming the “full system” of possible configurations of the channel operation. Conditioned on the existing as minimum 1 signal in 8 ASNT channels there could be the following possibilities of number of counts in top and bottom layers (the first sign in the pair is corresponding to the bottom thick scintillator): many-many [m-m] (more than one count in 4 bottom and 4 top layers), many-zero [m-z] (more than 1 in bottom and nothing in 4 top), zero-many [z-m], zero-one [z-o], one-zero [o-z], many-one [m-o], one-many [o-m]. The fraction of the “special” coincidences relative to the “main” trigger is posted in the Table 3 the time-series of the s “special” triggers are posted in the . columns 32 - the number of the “main” triggers – at least one signal in 8 channels in preselected time span (1 minute). If we consider all logical configurations of ASNT operation outcomes, this number will be equal to sum of the columns 9-31. As we mention already the number of triggers is ~ 4 KHz, dependent on the hardware settings: PMT high voltage and threshold of channel “firing”. columns 41-68 – the correlation matrix, see Table 5. By integrating the histograms spectrum1,..., spectrum4 and spectrum9,...,spectrum12 we can calculate the count rates according to 4 predefined thresholds on the value of the energy release (PMT output), to continue time series in the same data format as old version of ASNT started from 1996. As a first (or zero- threshold) we use the sum of all channels of the histogram. To get number of particles with Threshold 1 we must calculate sum of the channels of the histogram from 17 to 127. For the Threshold 2 – sum of the 24-127 channels, Threshold 3 – 28-127 channels and Threshold 4 – 31-127 channels. To calculate count rate of the particles with thresholds for the detector 1-4 (60cm) we need spectrums 1-4 files. To calculate count rate of the particles with veto for the detector 1-4 we need spectrums 9-12 files (see Table 6). The detailed information on the many-many case: the time stamp and energy releases in all 8 ASNT cannels. This case is related to the Extensive Air Showers (EAS), when energy of primary particle is high enough to generate particle cascade with numerous secondary particles reaching earth surface. By selecting different subsamples of many-many case according to the number of detected secondary particles (energy releases) we can select events with different primary energy, thus constructing the energy spectra of the primary particles. The calibration of the ASNT can be done with MAKET-ANI EAS array (Chilingarian, et al., 2004). In the the time series of the count rates correspondent to different energy releases are posted. Another kind of events stored in the files with “events” extension is related to the horizontal muon traversal. The logical software trigger selects events when there are more than 2 signals in top or bottom layers only, i.e. selecting horizontally traversing particle, or group of particles. The additional condition of large energy release (the code >25) is rejecting coincidences of the vertical traversal of low energy particles. The acceptance of the system of bottom thick scintillators is rather large ~(+/- 8.50), the acceptance of very narrow system of the top thin scintillators will select horizontal muons within ~(+/- 0.70) of zenith angles.